Crowds chanting in unison, wolves hunting in a pack, the superorganism that is the ant colony: these are all things that require the coordination of many individuals to accomplish something that they could not on their own. And yet, replace any individual with another and the behavior will turn out pretty much the same. Right? Let’s look at the example of colonies of harvester ants that forage in the desert for seeds. These ants adjust their collective foraging behavior through small interactions between individuals: ants decide whether to leave the colony to search for food if they sense other successfully returning foragers. This way, if a lot of ants are returning with food, more ants will leave because the world is feeling bountiful. But if few ants are returning with food, fewer new ants will leave to search; it’s just not worth it when there’s not a lot of food out there. After all, leaving the colony carries a cost. Every moment in the desert desiccates the poor ant foragers, and if they stay out too long they’ll up and die. Either way is interesting. I can certainly imagine that a dynamic, collective behavior is controlled genetically. 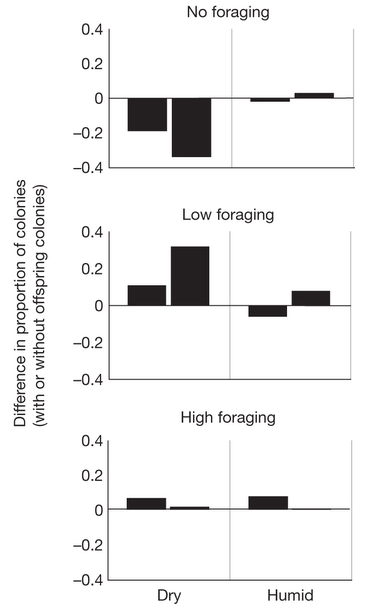 Dopamine receptor expression is linked to foraging behavior, so genetic differences here could easily transmit motivation to forage. And yet – cultural transmission would be pretty exciting, too. This would indicate there is some sort of learned component and makes me wonder: if we can measure all the movement of an animal throughout its life, how well could we predict the behavior of a whole group?